While the first and hardest-hit segment of the news business, newspapers, remains in the spotlight, local TV finds itself newly vulnerable, according to the Pew Research Center’s latest State of the News Media report. Local TV audiences were down across every key time slot and across all networks in 2012. And the off-peak news hours, like 4:30 a.m. news shows that stations had been adding for years seem to have hit their audience ceiling. While stations devoted more of their available air time to local news, that wasn’t sufficient to halt the decline in viewership. Early-morning newscasts continued to gain viewers, but that increase was more than offset by losses in most other time slots. The already considerable amount of time devoted to sports, weather and traffic on local newscasts rose even higher among the stations studied in the Pew Research Center’s latest State of the News media report. Airtime on those subjects increased from 32% 2005 to 40% in 2012. The biggest increase came in the airtime devoted to sports, to 12% from 7%. The traffic and weather components of the newscast increased by a smaller percentage (to 29% from 25%), but four in ten of the newscasts examined in the study led with a weather story. 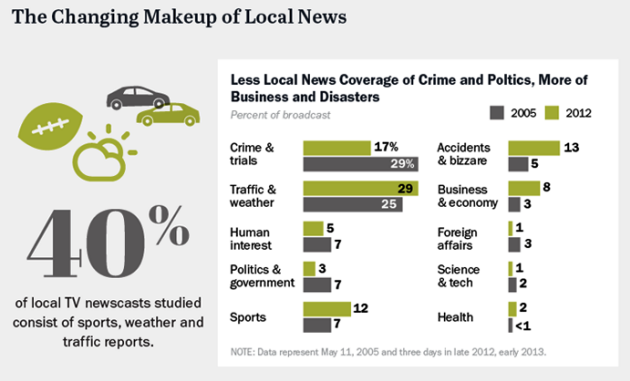 The topics people seek out the most on local TV news — weather and breaking news (and to a lesser extent, traffic) — are ripe for replacement by any number of Web- and mobile-based outlets. While many stations ramped up their digital news offerings in the past year, they are late to the digital game.